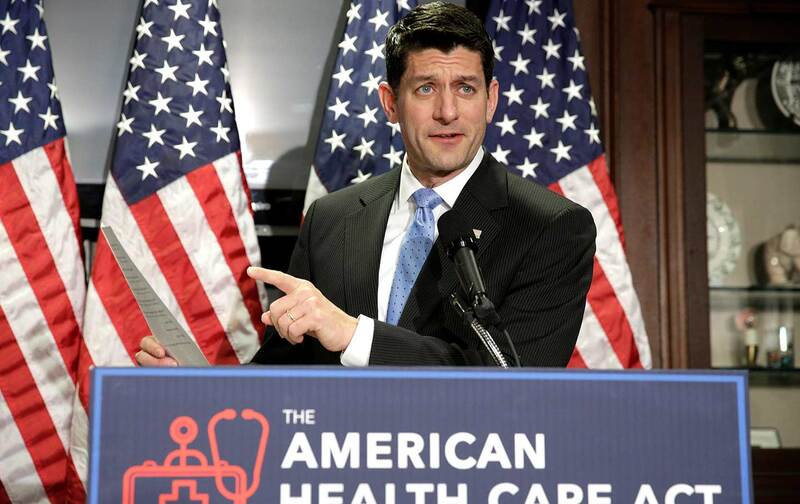 Republicans aren’t just gunning for Obamacare—they’re trying to radically alter Medicaid. Contrary to Trump’s talk, his party is aiming to pull the rug out from under people grappling with substance-abuse or mental-health issues. The GOP’s legislation to repeal parts of Obamacare—currently being rushed through Congress, with Trump’s backing—could yank coverage from 1.3 million people with behavioral-health needs, according to an analysis from health-care economists Richard Frank of Harvard University and Sherry Glied of New York University. “People with substance-abuse disorders are going to be the first casualty if this moves forward,” said Daniel Raymond, policy director of the Harm Reduction Coalition. That’s largely because of significant changes the bill makes to Medicaid, the insurance program for low-income Americans. Under the Affordable Care Act, addiction treatment and mental-health services were newly defined as “essential health benefits,” which meant that Medicaid and other insurers had to cover them. The ACA also offered states billions of dollars to expand Medicaid to people just over the poverty line who’d previously been ineligible for the program. About 2 million people with substance-abuse disorders who would otherwise be uninsured gained coverage through the expansion and the individual exchanges; a third of them are opioid users. The ACA also had a ripple effect on the treatment infrastructure: The promise of matching federal dollars prompted states to expand behavioral-health services—including treatment with medication, such as Suboxone—while reimbursements from insurers gave clinics more stability to scale up their services. Now that’s all in jeopardy. The House bill does not simply roll back the expansion—it carves into the rest of Medicaid, too, and it eliminates the mandate for mental-health and substance-abuse coverage. (Democratic Representative Kathy Castor called the GOP plan “the most radical rewrite to Medicaid that we have seen in decades.”) Starting in 2020, the Medicaid expansion would freeze, and people who try to sign up would be locked out. More critically, the new proposal alters the financial structure of the entire Medicaid program in a way that shifts more costs to the states. Under the GOP legislation, what is currently an open-ended financial commitment from the federal government would become a capped system, in which federal money is doled out on a per-capita basis, rather than rising or falling as state programs change. Health economists predict this allotment won’t keep up with actual costs, such as rapidly rising prescription-drug prices. Cost increases associated with new epidemics like the opioid crisis would be born by the states, and in response, they might choose to ration services, as Arizona did in 2010 by declining to cover certain transplant procedures. “It’s a nightmare,” said Sherry Glied, the dean of New York University’s Robert F. Wagner Graduate School of Public Service, of the prospective changes to Medicaid. Mental-health services, and substance-abuse treatment in particular, have historically been among the first to go when states look to make cuts in their health-care budgets, Glied said. Many of the states bearing a heavy burden of drug abuse already have critical budget shortfalls—West Virginia, for example. Medicaid is a major source of discord within the GOP, with a hard-right faction insistent that the replacement bill doesn’t go far enough to roll back the program. On the other hand, a handful of Republican governors and senators from expansion states understand how damaging the cuts would be to their constituents. “Phasing out Medicaid coverage without a viable alternative is counterproductive and unnecessarily puts at risk our ability to treat the drug-addicted, mentally ill, and working poor who now have access to a stable source of care,” Ohio Governor John Kasich said Tuesday. Kasich is one of six GOP governors in expansion states whose seats will be contested in 2018. Over 150,000 Ohioans and 22,000 West Virginians with behavioral health problems could lose coverage for treatment. Medicaid enrollees are among those who most need access to treatment. Economic hardship makes people more vulnerable to mental illness (and vice versa—without treatment, it’s harder for people to find or keep work). About 29 percent of people enrolled in Medicaid expansion alone need mental-health or substance-abuse treatment. Over 150,000 Ohioans, 80,000 Pennsylvanians, and 22,000 West Virginians with substance-abuse or other mental-health conditions now covered by the Medicaid expansion could lose their access to treatment. Those three states helped elect President Trump. Is this what they thought they were voting for?